Click Here for all the details and great reviews on Chris' new book. Chris Roberts was born in Long Beach, California. Chris and his wife, Susie Rose, have entertained over a quarter of a century as a singing duo in a popular Nevada Casino. He has five patented inventions of different products, one being the Taco Trap that was displayed on supermarket aisles for several years. 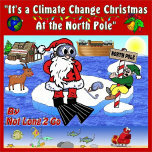 He wrote and recorded the popular novelty Christmas song, “It’s a Climate Change Christmas at the North Pole,” which is still available on iTunes and Amazon. Currently he devotes most of his creative efforts to writing where he lives, near Prescott, Arizona. Presently he is in the middle of another scary Sci-Fi Horror Thriller that he hopes to complete by the end of the year!